The Create and Share panels in Photoshop Elements 11 are available in the Organizer and are used to make choices for assembling creations and sharing creations. When you’re in the Photo Editor, only the Create panel is available. The Share panel is almost identical on Windows and the Macintosh. The only exception you find in Elements 11 is that Photo Mail is restricted to Windows users only. Here, you can see the Share panel as it appears on Windows (left) and on the Macintosh (right). 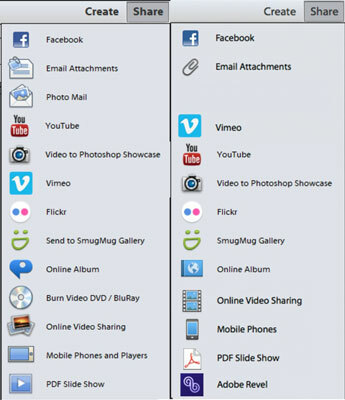 The Share panel in the Organizer has the same options found in the Photo Editor’s Expert mode. If you’ve installed Adobe Premiere Elements, you also see the following four choices: Burn Video DVD/BluRay, Burn Data CD/DVD (Windows only), Online Video Sharing, and Mobile Phones and Players. To share photos, you either select the images you want to share in the Organizer or load up photos in the Photo Bin in the Photo Editor’s Expert mode. Then click one of the buttons in the panel or open the More Options menu and choose one of the menu items.